Once a year, the Arts & Business Council of Greater Boston (ABC), throws a fund-raising event titled “Martinis & Masterpieces”. They celebrate the creative economy of the area, honoring lawyers, law firms and community leaders who make the Boston arts community the treasure that it is. As part of the celebration, they hold a silent auction of art work done by local artists. I’m excited to be participating in this for the second year. 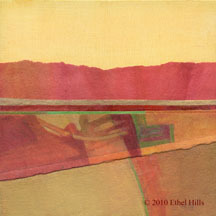 Although I won’t get to the event this year, I am sending one of my Color Blocks for the auction. This is one of the few auctions I participate in. The Arts & Business Council has some great programs to help artists, including workshops, the APT program, and Volunteer Lawyers for the Arts. I’m delighted to help the organization and I hope you will as well. This is the piece that will be in the silent auction. This one is a little bit different from some of my other pieces, but I really like the off beat combination of materials, patterns and textures. The lower 2/3 of the piece is built up of watercolor pieces, some new and some are pieces from discarded paintings. The upper 1/3 however is built from odd bits of tissue paper that are painted in a slightly more random, haphazard method. I’m hoping that it will find a good home at the auction. The Artist’s Professional Toolbox (APT) is finishing up this week. Fish & Richardson is one of several Boston law firms who have generously hosted classes for us. As we finish up the program, we’re heading towards a Portfolio Review there on Saturday. They have kindly asked us to put up some artwork in their offices, which will stay until after our Portfolio Review session on Saturday. I’m quite excited that we’ll be able to show off some of our art to at least some of the folks who have taken us in this year. Here’s a peek at my contribution. I’m currently enrolled in a professional development course called the Artists Professional Toolbox, APT. It’s a wonderful program run by the Arts & Business Council in Boston. A recent exercise was to ask customers and friends for 3 words or adjectives to describe your work. As part of this process, I asked a group of fellow artists and friends to take a look at the work in my Provident show and give me 3 words. I’ve been pleased that several people actually took the time to do just that. We also did this same thing as a group exercise at our APT workshop. I think for most of us, the words weren’t a total surprise. However, it has me thinking about how I describe my work and possibly even more about what the work is about. I’ve usually described my work as colorful abstract landscapes. Not bad, “color” or “colorful” was by far the winner in the branding words game. For single words, the next most frequent was “abstract” and then “bright”. However, only one person put down “landscape”. Beyond those few words, individual words only showed up once or twice. So then it’s not really a case of counting how many times a word appears, but of grouping words to come up with related ideas. When I looked at the words this way, I came up with several important ideas or themes that recurred –positive emotion (cheerful, fun, good day, playful), spiritual (serene, inspirational, restful), evocative (memories, suggestive, ambivalence), and finally landscape (outside, topographic, space). I think there’s something important about these non-art elements in the paintings that make them powerful and finding ways to describe these aspects will be important to me in presenting the work to the world.